Definition at line 45 of file llfloaterclothing.h. Definition at line 72 of file llfloaterclothing.cpp. References LLInventoryModel::addObserver(), LLUICtrlFactory::buildFloater(), LLPanel::childGetListInterface(), LLPanel::childSetAction(), LLPanel::childSetCommitCallback(), LLPanel::childSetDoubleClickCallback(), gInventory, gUICtrlFactory, list, LOADING_STRING, onClickTakeOff(), onClickWear(), onCommitList(), LLPanel::setDefaultBtn(), sInstance, sObserver, and LLInventoryModel::startBackgroundFetch(). Definition at line 102 of file llfloaterclothing.cpp. References gInventory, NULL, LLInventoryModel::removeObserver(), sInstance, and sObserver. Definition at line 243 of file llfloaterclothing.cpp. 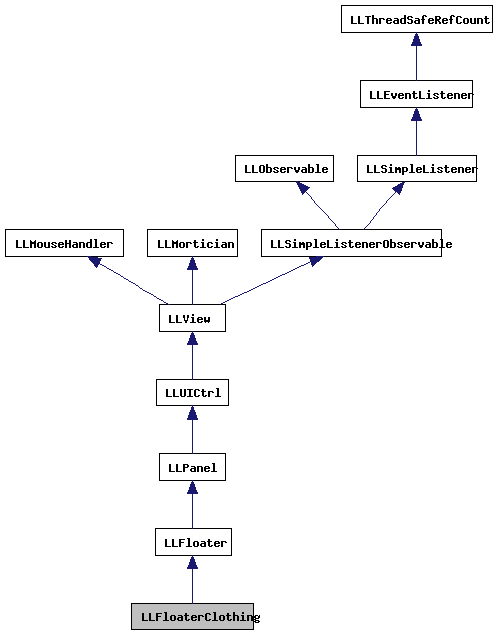 References LLInventoryModel::backgroundFetchActive(), LLPanel::childGetListInterface(), LLInventoryModel::collectDescendentsIf(), count, LLInventoryModel::EXCLUDE_TRASH, FALSE, gAgent, get_item_icon_uuid(), LLAgent::getInventoryRootID(), gInventory, i, LLInventoryItem::II_FLAGS_OBJECT_HAS_MULTIPLE_ITEMS, LLAgent::isWearingItem(), list, LOADING_STRING, mAllowSelection, LLCtrlSelectionInterface::OP_DELETE, S32, TRUE, and LLWearable::typeToTypeLabel(). Definition at line 367 of file llfloaterclothing.cpp. References gAgent, LLAgent::getAvatarObject(), LLInventoryItem::getFlags(), LLInventoryModel::getItem(), LLAgent::getWearable(), gInventory, llendl, llwarns, LLAgent::removeWearable(), and wearable_can_take_off(). Definition at line 325 of file llfloaterclothing.cpp. References LLInventoryModel::getItem(), gInventory, llendl, llwarns, and wear_inventory_item_on_avatar(). Definition at line 113 of file llfloaterclothing.cpp. Definition at line 396 of file llfloaterclothing.cpp. References gAgent, LLAgent::getAvatarObject(), LLInventoryItem::getFlags(), LLInventoryModel::getItem(), gInventory, LLAgent::isWearingItem(), and wearable_can_take_off(). Referenced by LLFloaterClothing(), refreshAll(), and show(). Definition at line 164 of file llfloaterclothing.cpp. References buildClothingList(), LLPanel::childGetListInterface(), LLPanel::childGetScrollInterface(), LLUUID::isNull(), list, mAllowSelection, mSelectedID, NULL, onCommitList(), LLCtrlSelectionInterface::OP_DESELECT, LLCtrlScrollInterface::scrollToShowSelected(), and sInstance. Definition at line 122 of file llfloaterclothing.cpp. References gSavedSettings, LLFloaterClothing(), NULL, LLUUID::null, onCommitList(), LLCtrlSelectionInterface::selectFirstItem(), LLControlGroup::setBOOL(), LLFloater::setVisibleAndFrontmost(), sInstance, and TRUE. Definition at line 151 of file llfloaterclothing.cpp. References LLFloater::close(), LLView::getVisible(), show(), and sInstance. Definition at line 67 of file llfloaterclothing.h. Referenced by buildClothingList(), and refreshAll(). Definition at line 66 of file llfloaterclothing.h. Definition at line 69 of file llfloaterclothing.h. Referenced by LLFloaterClothing(), refreshAll(), show(), toggleVisibility(), and ~LLFloaterClothing(). Definition at line 70 of file llfloaterclothing.h. Referenced by LLFloaterClothing(), and ~LLFloaterClothing().